Just about everyone I know who reads mysteries and has read Louise Penny's Chief Inspector Gamache's series loves and recommends it. I actually have the first book in the series in my TBR collection. Several books into the series later, I'm finally reading one of her books--just not that first book in the series. I was a big stickler for reading series books in order until I began blogging. I am not sure what's happened to me. Of course, in this instance, I didn't have time to play catch up with the series--seven books total. A Trick of the Light was short-listed for an Independent Literary Award and so I was under a deadline to read it. No matter. Like with a lot of mystery series, the book stands well on its own. In this case, however, I really do wish I had read the previous books as I have a feeling many of the characters have made appearances before, all tied to another mystery. And that other mystery, well, could it be from another book that is now spoiled? Spoiled in the sense of my knowing the outcome as opposed to being ruined, I mean. There's also the characters' personal stories, which take place over the course of the books--there is so much I feel I missed out on. Yet, the author did a good job of putting enough of the pieces together in this one novel to make it okay that I didn't start with the first book in the series. I just wish I did. Anyhow, I went into Louise Penny's novel with high expectations. Not only was it a nominee for an award but it also came so highly recommended. Fortunately, I wasn't disappointed. I loved just about everything in this book: from the depth of the characters, including many of the minor ones; the easy and sometimes comical banter between the characters; the serious and sensitive handling of the crime and the issues surrounding it; the atmospheric setting; and the superb writing. I am not well versed in the art world. My mother-in-law paints beautiful landscapes and my husband can put together a lovely sketch, but I'm a stick figure woman all the way. Stick figures with big heads. So, the setting was one that was a bit foreign to me (besides being set in Canada). I felt right at home in Three Pines, however. It sounds like a place I wouldn't mind living. There was one scene in particular that was difficult for me to read, the one where the detectives have to tell the parents of the victim that she's dead. It was heart breaking. All I could think about was how horrible it would be to be in their shoes and how I hope I (or you) never have to experience anything like that in our lives. I have read and seen lots of scenes like this over the years, but having just had a child of my own, I am a little more sensitive to it right now, I think. The other aspect that of the novel that really got to me was the focus on addiction, particularly alcoholism. It is a problem that touches many of us in one way or another. For me it was in living with an alcoholic parent. The author approached the topic in a very hands on way, offering different perspectives through the various characters, many of which were in different stages of addiction. I don't think it's a major spoiler to mention this--although I won't get more specific. I really appreciated how the author presented the characters--how she used the theme of light and dark in drawing them out. Everyone, including the main protagonist, Inspector Gamache, had many shades to him. On one hand he was near perfect, admired by just about all; on the other, he had his share of secrets and doubt. Will I read another Louise Penny novel? Absolutely! I will never get caught up with all the series I want to read if I keep this up! You can learn more about Louise Penny and her books on the author's website. Source: A copy of this book was provided by the publisher for review. This book counts towards the What's in a Name Challenge and The Eclectic Reading Challenge. I believe I read a couple of these prior to blogging. I can't remember! I too was a vigilant "read it all in order" person at one point, but there are just way too many series to keep up with. I saw this one floating around on audio. I'll have to see if I can get it! One more thing. Louise knows about addiction. She makes no bones about being a member of AA for many years herself. She usually talks about it on her blog once a year - on her sobriety anniverary. I think that fact alone makes her writing about this issue so authentic. I'm so excited about her new book to come in late August - A BEAUTIFUL MYSTERY. Can't wait! It sounds like this book touched you on so many levels, and I really like how wonderfully you expressed that in your review. I am also a person who likes to read series books in order, and would love to read these from the beginning. I have heard a lot of good things about the author, and this series in particular. Fantastic review today. I need to read this one! I have heard a lot of good things about this author but never read her myself. I must remedy that! I have this out from the library RIGHT NOW! I still have a few weeks to get to it. The next in the series comes out in August - just warning you. I read my first Penny book at the beginning of the year and loved it! will continue on with this series for sure! Loved your thoughts on this one! 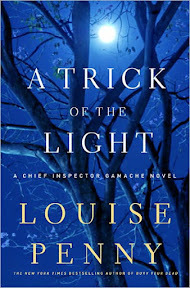 I read one of the Gamache series last year and loved it; Louise Penny does a remarkable job with engaging the reader in the emotions, and it sounds like this one continues to carry on that talent. I look forward topicking up a copy of this one soon. I am not big on mystery but if I ever pick a mystery up, it's going to be one of Penny's books (heard too many good things to ignore). I'm reading this series in order, and I'm about to start shortly the one behind this one, Bury Your Dead. I have loved this series ever since it came out, so I am delighted that not only did you enjoy it enough to try another one, but that it's set in Canada too! yaaay! I think you will find if you go back to Still Life (the first one), you will see all that character growth and history unfold as well as each of the very different mysteries each book holds. Gamache is quite an extraordinary detective, isn't he? I am going to check into it, however. I'm feeling the need to branch out, reading-wise again. Too many paranormal stories, not enough others. I keep wanting to try this author but getting side-tracked with others. Glad you enjoyed it! I MUST begin this series sometime soon! I've heard such good things about it. I've even had the 1st book checked out from the library a couple of times but unfortunately I've never gotten to it. Thanks for reminding me about this author! The great thing about a series is you get to read so many and the bad thing is that you have so many to read! This sounds like a great series to latch onto! This is a series I intend to read, but I must start with the first one, always. I have found I am more sensitive to child-parent tragedies now that I have Gage. I refuse to read the ones I know will be bad, but sometimes something will sneak in unexpectedly!